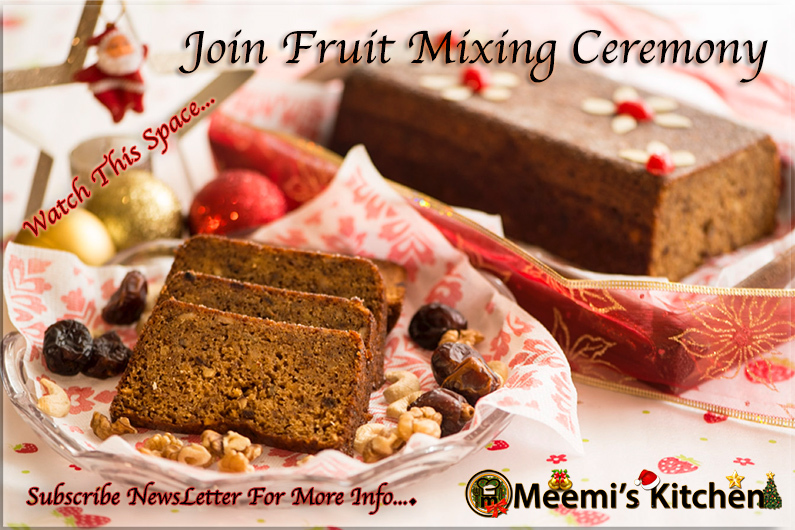 “Meemis kitchen” invite all of you to be part of “Virtual Christmas cake- Fruit Mixing Ceremony”!. Welcome this Christmas season with the “Fruit soaking Ceremony” which is the first step towards this tradition, that is observed worldwide!. Christmas is no fun without traditional Christmas Fruit cake or Rich Plum cake. Preparations begin several weeks in advance and it is a fun way of ushering the Spirit of the season! Please see below the list of ingredients required for making three Christmas fruit cakes (approx.1 ½ kg. cake). You may adjust the measures as per your requirements. 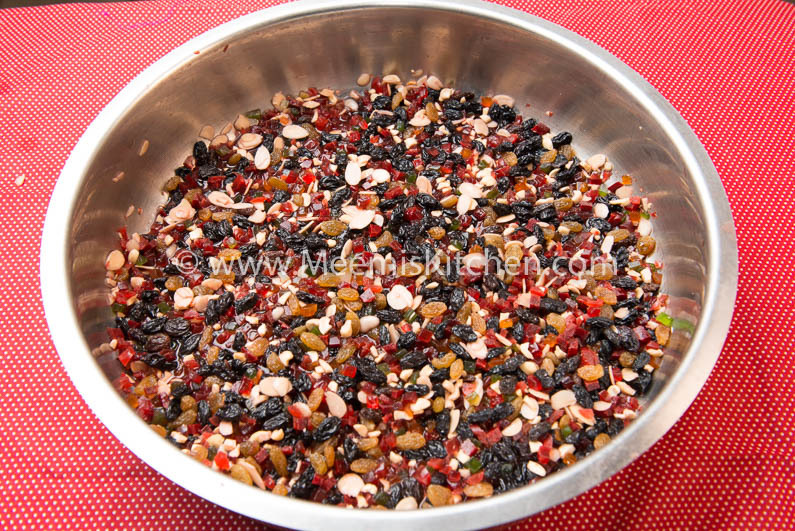 Check the ingredients for Rich Plum Cake recipe (with variety dry fruits) here. Now, next step is getting the Ingredients ready for mixing. 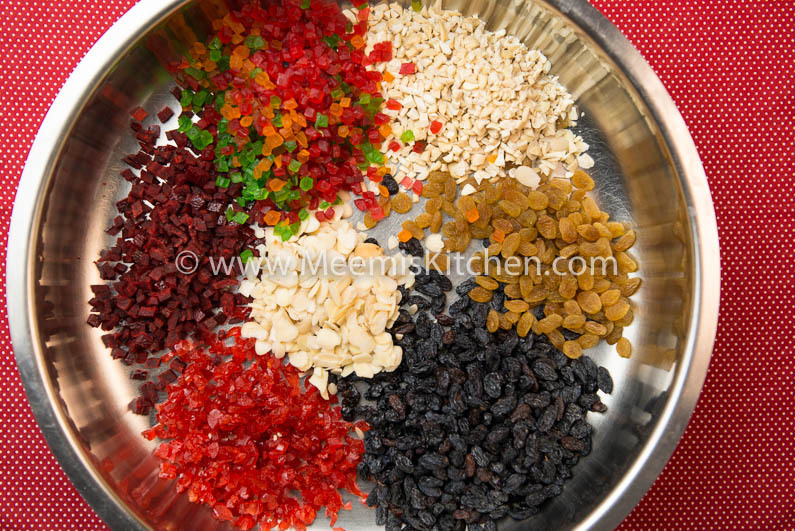 Since the raisins might have impurities and chemical residue on it, we need to wash it thoroughly and drain it. 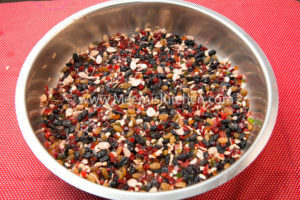 Wash the raisins well and drain them nicely. 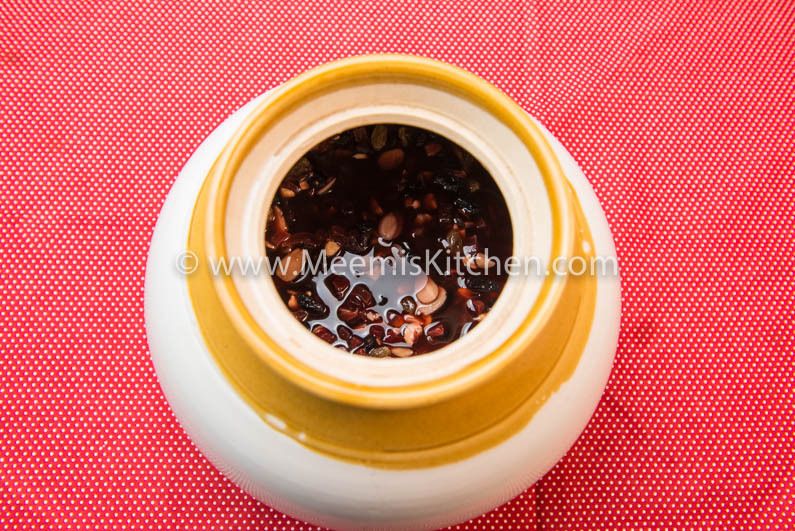 Chop the Cashew nuts and Almonds (if you are using flakes; avoid this step). Cut the Cherries and Orange peel into smaller pieces. Keep them ready for mixing. You need a wide basin for mixing, and we also need an airtight jar or bottle (preferably a ceramic/ glass Jar) to keep them soaked till Christmas time, when we start our baking session. Now arrange in piles all the ingredients that are to be mixed in the basin and start the fun/ work. Mix, mix and MIX!! Please take care not to squeeze, but gently mix to combine. Next, you can pour the wine and Brandy/ Rum to soak the fruits (No swigs, please!). Again, mix gently and take the gloves off. Get a clean and dry airtight jar or bottle (preferably a ceramic/ glass Jar) and transfer the mix to it. 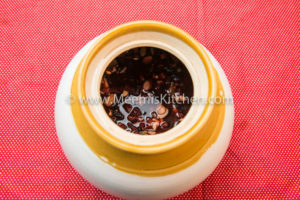 The fruits should be immersed in the liquor so add more if required. Close with lid tightly and keep them soaked till Christmas time, when we start our baking session. You just need to shake it once in a while to ensure that all flavors of the ingredients come out well. Ideal time for soaking is one month or more; but the longer the soaking time, more flavorful it will be! I will be sending instructions about the rest of the ingredients that go into the making of the Christmas Fruit Cake, so you can arrange and be prepared to bake the Christmas cake by 22nd December. Mark this day on your calendars and stay tuned for more instructions. Let’s bake together!